It's been a tough couple of years for investors. Many have seen their retirement accounts dwindle dramatically and are looking for a safe way to protect what they have and make back some of what they've lost. 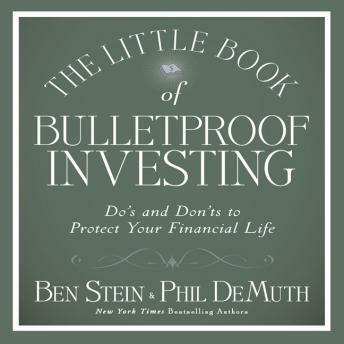 That's why the bestselling author team of Ben Stein and Phil DeMuth has created The Little Book of Bulletproof Investing. When you invest, there are essential things you should do and many things you shouldn't. The Little Book of Bulletproof Investing addresses these important issues and shows you how to utilize the fundamentals of finance to achieve success in today's market. Filled with in-depth insights and practical advice, The Little Book of Bulletproof Investing offers quick, easy-to-follow, and entertaining financial guidance for anyone looking to get back on the right investment track. Very high level, doesn’t get into as much detail as I’d expected.